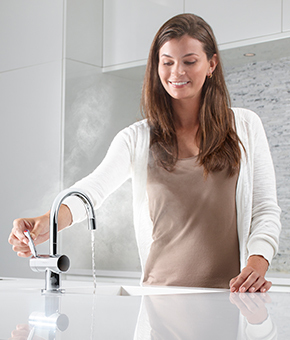 InSinkErator® steaming hot and ambient filtered water taps don’t just bring contemporary style to the kitchen sink – they bring ultimate convenience and efficiency to simplify your life in the kitchen. 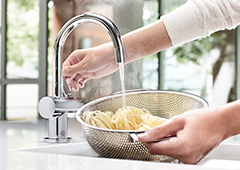 At the flick of a lever, our Steaming Hot Water Taps are ready to dispense filtered, near-boiling water – the perfect temperature for making hot drinks, speeding up the preparation of pasta or vegetables, cleaning dishes and a host of other kitchen tasks. Our hot/cold models also dispense ambient filtered water for the best tasting and safest drinking water on demand. No kettles, no clutter, no fuss... just near-boiling and ambient filtered water at your fingertips. Once you have one, you’ll wonder how you ever did without it. Explore our Steaming Hot Water Tap product range below or scroll down further to learn more. While the steaming hot water tap sits elegantly on your sink, the hot water tank sits conveniently under it. Water comes up from your supply line to the compact 2/3 gallon, 60-cup capacity stainless steel tank where it is heated. As water is dispensed, fresh water flows into the tank and the cycle continues. It’s that simple. 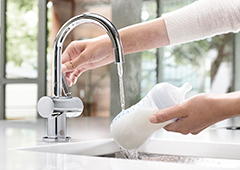 All InSinkErator® taps are fitted with a safety shut-off feature. The 3300 model benefits from a hot water push-lever locking mechanism and the 1100 model has a self-closing hot water valve that cuts off the hot water supply as soon as the lever is released. Our taps also feature an unobtrusive filtration system under the sink that reduces chlorine, turbidity and other unpleasant tastes and odours. Cool water. Hot water. Steaming hot water. Over centuries, we have marveled at how Italians have enhanced design and fashion leaving their cultural mark on the world. Leading the way, forging new ground, pushing the boundaries as part of a deep-seated desire to really embrace life's rich tapestry. The new HC3300 is a stylish addition to any kitchen and the latest addition to the InSinkErator range of taps. Created to complement contemporary kitchen designs, it dispenses both near-boiling and ambient filtered water at the touch of a single handle. Available in Polished Chrome finish. Turn on the style with the H3300, a contemporary addition to the InSinkErator range. 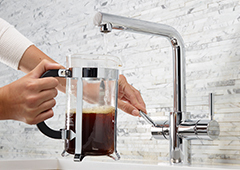 Created to complement contemporary kitchen designs, it dispenses near-boiling filtered water at the touch of a lever. Available in Polished Chrome finish. Offering both hot and ambient cold filtered water from the same tap, the HC1100 can produce near-boiling water, as well as safe, filtered ambient cold drinking water on demand. It's the perfect addition to any kitchen. Available in Polished Chrome finish. The GN1100 is ideal for making tea, preparing pasta, blanching vegetables, cleaning dishes – and a hundred other uses. Available in Polished Chrome finish.